Watch This Year’s Wimbledon Championships in 3D! This year you can watch the Wimbledon Championship on your 3D-TV. Rise up your TV Lift Cabinet, grab your 3D glasses and enjoy the finals as if you were there. All coverage of the men’s singles semi-finals and the ladies and men’s singles finals will be captured in 3D. Sony has been working hard with The All England Lawn Tennis CLUB (AELTC) to bring this event to its full viewing potential. Sony will be handling all the theatrical distributions with the help of their company’s theatrical distribution partner, SuperVision Media. Don’t have a 3D-TV? Don’t worry you can go to any 3D-equipped theater throughout the world to watch your favorite matches. 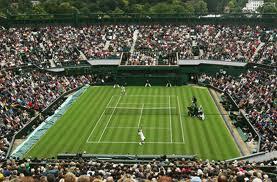 The 2011 Wimbledon Championship begins on June 20 and runs through July 3.